Fashion for men in the 50s usually meant a trip to Burton's for a new suit. Suits were worn for nights out and for most social occasions. For younger men, the Teddy Boy style was a chance to escape from the uniformity of the 50s. Casual clothes for men were also starting to make an appearance in the 50s. Most men preferred the conventional suit in the fifties. They usually went to a tailor to be measured up. The choice of tailor depended upon their income. For most men, it was Montague Burton or the Fifty Shilling Taylor. Suits were conventional in appearance in sober colours such as grey or navy. Soldiers returning from the War wanted something flashy in contrast to their uniforms. After the War Cecil Gee popularised the American look: double breasted jacket, wide tie, coloured shirt. This was mainstream men's fashion in the very early years of the 50s. This new look was popular with a new criminal class which was seen as a threat to Britain's middle classes. The blazer, or sports coat with non-matching trousers, pictured right, was an alternative to the suit. This look was less formal than the suit and would not have been suitable for all occasions in the 50s. For leisure wear during the day, the blouson jacket, similar to a soldier's battle dress was sometimes worn. Although this is informal dress, this man is still wearing a tie. 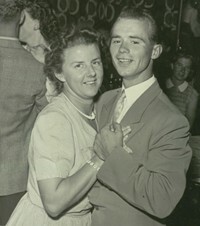 This photograph, left, is from 1953. The man's trousers are still quite wide following 40s fashion. There was already a recognised style for Britain's youth before the Teddy Boy. In the early fifties, people in Britain thought that they were under threat from a rising wave of violent crime. A new breed of young criminal was taking to the streets armed with a cosh, a bicycle chain and occasionally a gun. He was dressed sharply in the fashion of the era - Brylcreemed hair, a jacket with big shoulder pads and an exaggerated waist and wearing flash tie around his neck. He was generally referred to as a hoodlum or a juvenile delinquent. This was the style adopted by Albert Swift in 'Get Carter' by Ted Lewis (published as 'Jack's return Home' in 1970). Albert was a local gangster and Jack, when reminiscing about his adolescence in the North of England, recalled the time when he first met Albert. Albert and his gang had swaggered into a billiard hall. They terrorised the attendant and Jack's brother with lighted bangers. Jack felt nothing but admiration for Albert. It was also the style adopted by Dirk Bogarde in his portrayal of Tom Riley in 'The Blue Lamp', produced by Ealing Studios in 1950. Tom Riley and his pal, Spud, (Patrick Doonan) plan to rob a cinema with the help of Diana Lewis (Peggy Evans). Tom takes along a revolver. The plan goes wrong and Tom is confronted by PC George Dixon (Jack Warner). Dixon asks him to hand over the gun, but Tom, in a scene reminiscent of the Craig and Bentley case, shoots him dead. Ton-up boys were motor cycle fanatics. The name comes from doing over a ton: one hundred miles per hour. James Dean was their style influence, with denim jeans and black leather jackets being de rigeur. In the sixties they became known as rockers. Beatniks were thoughtful and introspective people. They wore unconventional clothes: usually pull-overs rather than jackets, and baggy flannel trousers.